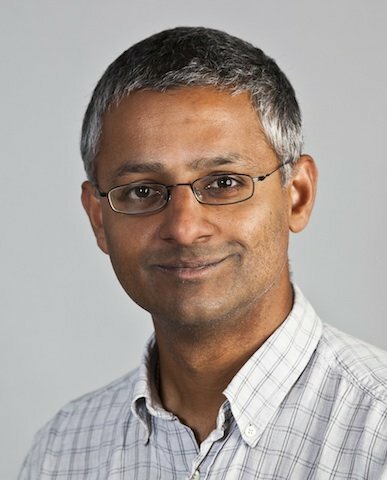 Shankar Balasubramanian, Professor at Cambridge and co-founder of Solexa, talks about the rapid progress achieved in the field of genome sequencing in the last two decades. Shankar Balasubramanian, the Herschel Smith Professorof Medicinal Chemistry at the University of Cambridge, UK and co-inventor of the next generation sequencing methodology, Solexa sequencing, delivered the final talk of the DNA@70 lecture series. Organised by the Wellcome Trust/DBT India Alliance, the DNA@70 Public Lecture series commemorates the discovery that DNA carries genetic information, by Oswald Avery, Colin MacLeod and Maclyn McCarty in 1944. Addressing a packed auditorium at the Department of Biological Sciences, Indian Institute of Science, Bangalore, Balasubramanian traced the history of DNA sequencing and how he developed the genome sequencing technology with his colleague, David Klenerman. Way back in 1995, Balasubramanian and Klenerman proposed and built a system to observe the motion of the DNA polymerase as it synthesized a single DNA molecule immobilized to a surface, using fluorescent labels. They postulated that this approach could be used to sequence DNA and went on to develop a new technology based on the idea. Subsequently, they co-founded Solexa, which has since been acquired by Illumina, to market the technology. “When we started in 1997, the goal was to sequence 1 billion bases (the human genome has 3 billion bases). Now one machine can sequence 1 trillion bases per experiment,” said Balasubramanian. He went on to list new avenues of research—epigenetics, the discovery of small RNA, chromatin structure and even data storage—that have opened up because of large sequencing capacities, none of which had been envisioned when they started working a few decades ago. “Things have changed precipitously since 2008,” he said, with personalized medicine being one of the biggest drivers of genome sequencing efforts worldwide. He went on to illustrate how sequencing can transform therapies with several anecdotes.